​Gift Cards Make Perfect Gifts! We have a two part gift card process. Click Submit below to submit your gift card information then move to step 2 by choosing a gift card denomination, click "Add to Cart" then complete your purchase through Paypal. 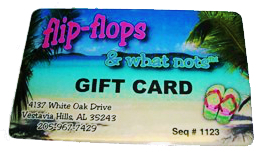 Gift cards are not redeemable for cash and expire one year from issue date.